This made me all nostalgic as it was this kind of vitriol that launched me on the Traffic road: How could this simple activity stir such passion? While I am delighted to see the issue receiving further elaboration and exploration, I should only clarify here that I was not advocating a Universal Late Merge plan. There are circumstances where this behavior would actually make things worse. But the point was more that in certain scenarios, it would work better (better traffic flow, shorter queues, etc. ), and that of course it would be better if drivers were instructed what to do — so as to not set off anger against the minority late merger position by early merge vigilantes — and then, having been instructed as how to properly merge, people then actually left these old prejudices behind (which trials have shown does not always happen). But this is admittedly complex, for what makes late merging a better overall system for some highway segment may depend on a change to a certain level of congestion (in which case you’d need real-time ‘dynamic’ signage announcing the late merge), or it may depend on the number of lanes on the highway, or it may depend on the volume of trucks on a particular ‘facility.’ The correct cure depends on the set of symptoms. Comments Off on Merge Overkill. Click here to leave a comment. 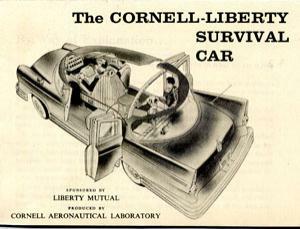 Paul Collins, one of those writers whose name always arouses my interest in a table of contents, revisits the seminal days of car safety with an appreciation of Liberty Mutual and Cornell University’s open-source “Survival Car” in the latest New Scientist. Edward Dye, director of Cornell’s crash injury project, noted that the design philosophy behind the car was the same as that for packaging any delicate object for shipping: “Use a strong packing case, fasten lid securely, pack tightly, and remove hard objects from the padding.” A conventional if sleek-looking saloon, the Survival Car sported a decidedly futuristic interior. Bucket “capsule seats” were firmly mounted to withstand a force of more than 2 tonnes, each featuring an integral head rest and roll bar and, of course, seat belts. The driver sat in the middle, with the passengers behind. Gone was the spear-like steering column and out went the lethal radio and heater knobs. In their place was an extraordinary hydraulic rudder control – a floor-mounted housing between the driver’s knees, with two stubby handles projecting out from the sides – and a padded dash with rounded and recessed knobs. This proved a bit too radical — and expensive as it wasn’t a standard production car — so the team went back and overhauled a 1960 Chevrolet Bel-Air with inexpensive safety features. What happened next has become all too familiar. Spurning the opportunity presented to them, American car makers watched as others forged ahead. The first car on American roads to embody the Survival Car ideal was not from Detroit but from Solihull in the English midlands. It was the Rover P6 2000 of 1963, whose seat belts, thick padding, safer steering wheel and crumple zones moved consumer campaigner Ralph Nader to declare it “probably the safest car now available for general sale”. Comments Off on Survival Car. Click here to leave a comment. Comments Off on Slow Traffic. Click here to leave a comment.